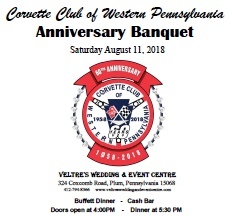 CCWP is celebrating our 60th year as the oldest Corvette club in the nation!…. 60th Anniversary is coming up on August 11th Doors open 4pm and dinner will be served at 5:30pm, with cash bar expected. PLEASE PLAN ON ARRIVING BETWEEN 3:30PM AND 4PM SO WE CAN ORGANIZE A GROUP PICTURE AND GET ALL CARS PARKED. Speakers: John Walko and other speakers planned. Items available for purchase include, Hats and Tee Shirts for $15/ea. New logo decal that has the 60th on it are available for $3.00. We also have thermal cups for $6.00 for members and $10.00 for non members. Costs: $30 per person with cash bar. RSVP with registration form and money due by no later than July 25th. Info also available in the newsletter.